Who says Music Fest gets to have all the SXSW fun? Local purveyors of all things arts and culture, Do512, is kicking off SXSW 2018 this Friday, March 9th, 6pm-2am, with their Interactive-Comedy-Music convergence party at Hotel Vegas and The Volstead Lounge on Austin’s Eastside. 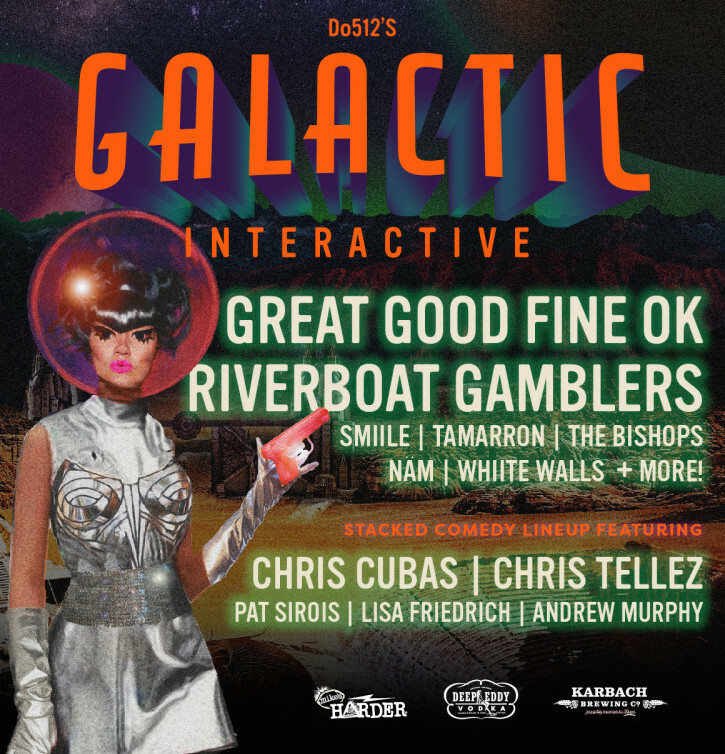 Cheekily dubbed “Galactic Interactive,” the event is a three-way marriage of live music shows, stand-up comedy and – you guessed it – a space-age theme to really get those festival juices flowing. Plus, Deep Eddy Vodka, Mike’s Harder and Karbach Brewing Co. will be slinging drinks all night long, so get your livers ready. Check out the music and comedy lineups below! The party will offer a veritable pu-pu platter of sonic stylings, ensuring there’s something for everyone in your SX crew. Brooklyn synthpop duo, Great Good Fine OK nabbed the headliners spot, while Riverboat Gamblers, SMiiLE, Tamarron, The Bishops, Näm, Whiite Walls, Blastfamous USA, FEE LION, Being Dead, and DJ King Ding will be rounding out the lineup. A night of belly laughs more your thing? The stage inside at The Volstead will feature a revolving door of funny guys and gals, including Pat Sirois as host, Chris Cubas, Chris Tellez, Lisa Friedrich and Andrew Murphy. Oh, and did we mention the out-of-this-world dance party happening in the venues’ joint backyard? Far out! Entry to this self-proclaimed “full-on rager” is free with RSVP on Do512’s website. It is 21+, so be sure you have your ID. As always, the party’s subject to venue capacity, so do yourself a favor and get there early. Plus, according to the event’s Facebook page, the first 10 people in line that show they have Do512’s app will get some free stuff! Doors open at 6pm, and the party goes until 2am. Way to kick off SXSW 2018 right!